Send Gift Philippines | Belated Birthday ! Yikes !! Did you jus' forget someone's B'day? Well you can quit worrying and choose from a whole lotta cute 'n' funny wishes to wish your buddy/ loved one/ sweetheart a very happy belated birthday. 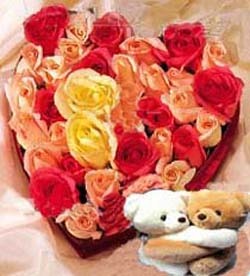 (36 mix roses and couple bear).